Have fun with unlimited creative and imagination! Knit Face Painting series of products is designed to provide safe and fun face painting for children. We have been trying to provide children with a happy childhood, while training children’s imagination and creativity. Our 218 Face Paint Stencils are uniquely designed for various parties and events, You can enjoy face painting with our stencils even if you are a beginner! No matter how your painting skill is, you will easily be able to create fun using our stencils. 3.Let dry according to paint instructions. 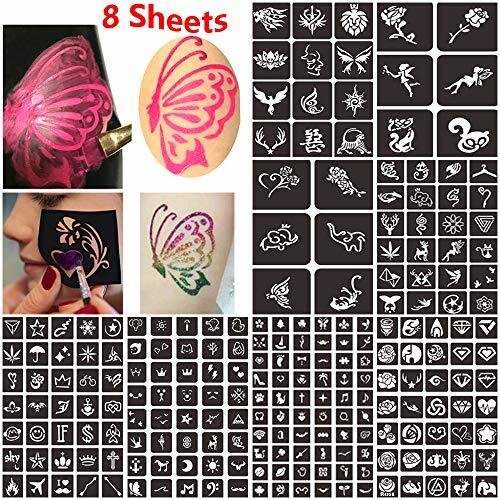 PACKAGE INCLUDED:8 Sheets face & body painting stencils Sticker include 218 images for boys and girls, Kids feel free to create any scene using their endless creativity and imagination. EASY TO USE:These face paint stencils are self-adhesive and can stick securely to the skin and enable an outline of the image without seeping, so you’d never wind up with a smeared image. VERSATILE:218 Patterns, widely used in Body Glitter Tattoos, Face Painting, Airbrushing tattoo, painting on wood, Craft Projects etc. SAFE & NON-TOXIC:These stencils are made of safe and non-toxic materials that are 100% safe guarantee for kids, 8 Kinds Of Sheets Satisfied Many Crowd: Female, Male, Children, Teenagers. Each size is 11.4 * 8.2 inches. BUY WITH CONFIDENCE:Our customer service always stand by your 100% satisfaction, We look forward to your message below to share your shopping experience, so that we continue to improve and innovate.